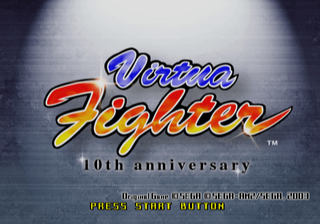 Virtua Fighter 10th Anniversary (バーチャファイター 10th Anniversary) is a fighting game for the PlayStation 2, released around the same period of Virtua Fighter 4 Evolution. As the name suggests, it was designed to commemorate ten years since the release of Virtua Fighter. While static screenshots suggest that 10th Anniversary looks like the original Sega Model 1 release Virtua Fighter, gameplay is more akin to Virtua Fighter 4: Evolution, being a generally faster and more fluid experience, albeit with fewer moves than what Virtua Fighter 4 offers. Many of the assets such as 2D elements, sound effects and voice samples are in fact lifted directly from Virtua Fighter 4: Evolution. During a normal run of the game, players compete against the original cast of Virtua Fighter (sans Dural), before moving onto Virtua Fighter 2's Lion and Shun, Virtua Fighter 3's Aoi and the remaining cast of Virtua Fighter 4 and Virtua Fighter 4: Evolution. As with all Virtua Fighter games, Dural is fought at the end. Characters which did not exist in the original Virtua Fighter do not get their own stages, with the arenas instead being recycled. The trademark "floaty jumps" from the original Virtua Fighter make a return, and as all the stages retain their flat appearance from the original game, there is a reintroduced focus on ring-outs. Like all versions of Virtua Fighter 4, Virtua Fighter 3's Taka-Arashi is not included in the game and would not return to the series until Virtua Fighter 5 R.
10th Anniversary's release is not straightfoward. It was originally released as part of the Virtua Fighter 10th Anniversary: Memory of Decade package (which also contains a book and DVD video) in 2003 - copies which are very rare and feature Jacky Bryant on the cover. More common is the "Fukkoku Ban" (復刻版) re-release with Akira Yuki on the cover - these were bundled with Japanese copies of Virtua Fighter 4 Evolution and also given away as a bonus for those pre-ordering the PlayStation 3 version of Virtua Fighter 5 through the Sega Direct website (remembering that at the time, all PlayStation 3s could run PlayStation 2 games). In North America, the game was included on the same disc as the PlayStation 2 release of Virtua Fighter 4 Evolution, and in Europe it was offered as a promotional item in small supplies. European copies in particular have become extremely rare which has pushed up the game's value. Main article: Virtua Fighter 10th Anniversary/Magazine articles.